Mariah Landrum Childs is the Founder and CEO of Celestial Enterprises Unlimited, Inc. Her God-given vision for this faith-based organization grew out of her extensive social work counseling, community organization and literary backgrounds. Ms. Childs is a state liscensed clinical social worker. She has a special calling to counsel and empower women and youth who have suffered from HIV/AIDS, domestic violence and other forms of abuse. Her primary goal is to comfort and help "heal the broken-hearted" so that they can reach their optimun levels of functioning emotionally, spiritually and socially. Ms. Childs forms collaborative partnerships with churches, agencies and organizations nationally and internationally to achieve these goals. Ms. Childs uses a holistic approach in her counseling and incorporates prayer and the Word of God as essential elements in the treatment process. Excellent clinical skills, prayer and biblical principles are the foundation of her counseling ministry. She teaching her clients how to apply prayer and biblical principles in their daily living so they can achieve their highest level of emotional, spiritual and social functioning. Her ultimate goal is to restore and reunite families that have been physically separated or torn apart emotionally due to abuse, financial hardships or illness such as HIV/AIDS. Ms. Childs has also published several books to assist women in overcoming challenges in their lives and to learn through reading the testimonies of other women the faithfulness of God to bring them through abuse, divorce, illness and other hardships: WOMEN OF VISION Their Lives, Struggles and Triumphs,NO MORE TEARS Surviving Abuse, STILL STANDING women who refuse to give up, LIFE REFLECTIONS and WALKING THROUGH THE VALLEY. These books can be ordered through the BOOKSTORE section of this site or by contacting Ms. Childs at celestialeu@gmail.com or by calling her at 1-470-504-0471. Ms. Childs is also an ordained Elder. In 2002, she accepted the call to "Therefore, go and make disciples of all nations, baptizing them in the name of the Father and the Son and the Holy Spirit and "To teach these new discples to obey all the commands I have given you" Matthew 26:19-20. Elder Childs has a special ministry to orphans in Africa and Haiti, especially those suffering due to the deadly affects of the HIV/AIDS epidemic. 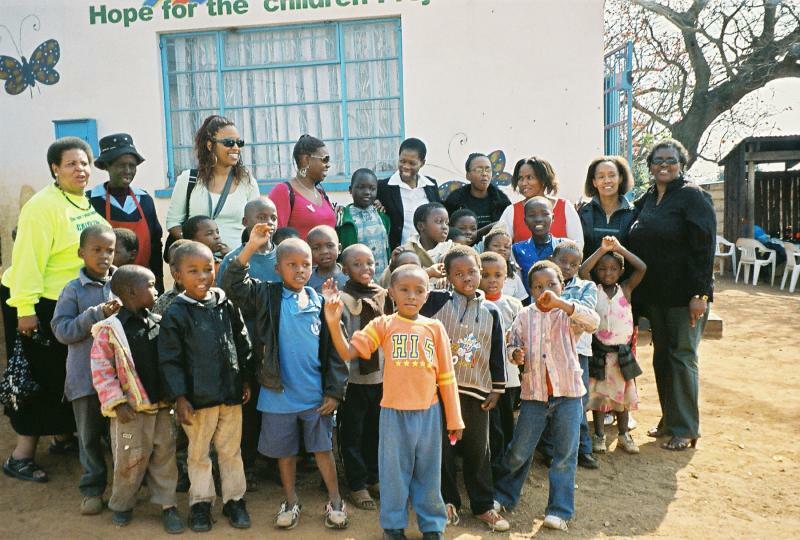 She organizes fund-raising initiatives, such as "Voices in the Wilderness" HIV/AIDS Quilt of Hope Exibit and Their Stories Theatrical Production, and solicits doantions to assist in providing the food, clothing and shelter these disadvantaged children need. She believes, For nothing is impossible with God" Luke 1:37. 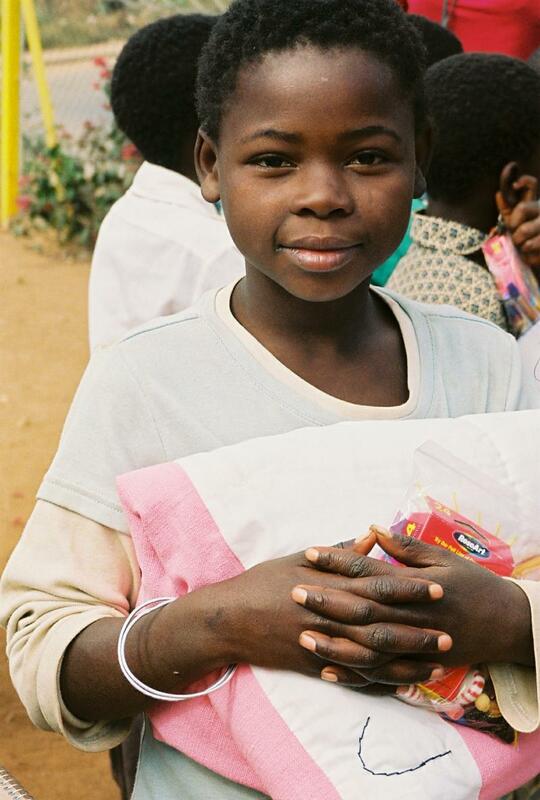 Through the Redeeming Life Quilt Ministry, Elder Childs has made and collected over a hundred quilts stitched with loving care and prayers by Godly women in Georgia, Noth Carolina and Albany, New York for orphans in Africa. Elder Childs hand embroidered biblical scriptures on the quilts to "cover" the orphans with the Word of God. Elder Childs with an orphan at the Empngeni Methodist Church in Zululand, South Africa holding one of Elder's Childs' hand embroidered quilts. 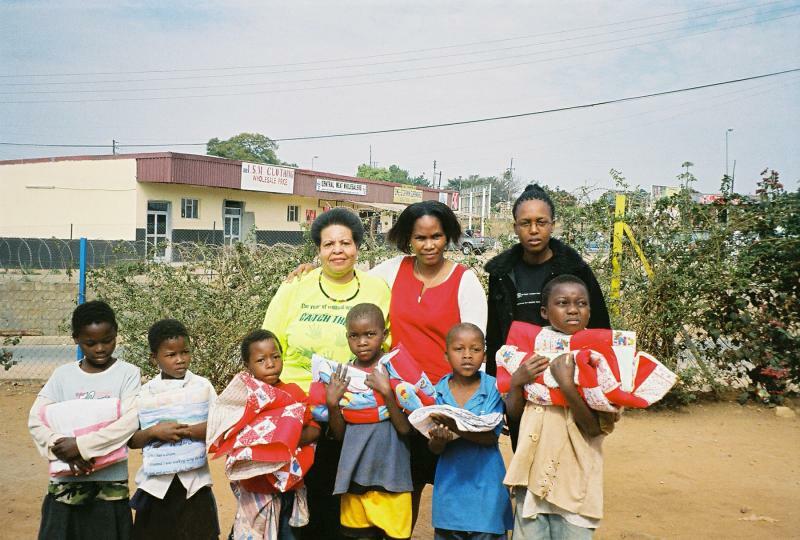 Elder Childs with orphans at the Empangeni Methodist Church in Zululand, South Africa holding the quilts they received from the Redeeming Life Quilt Ministry. 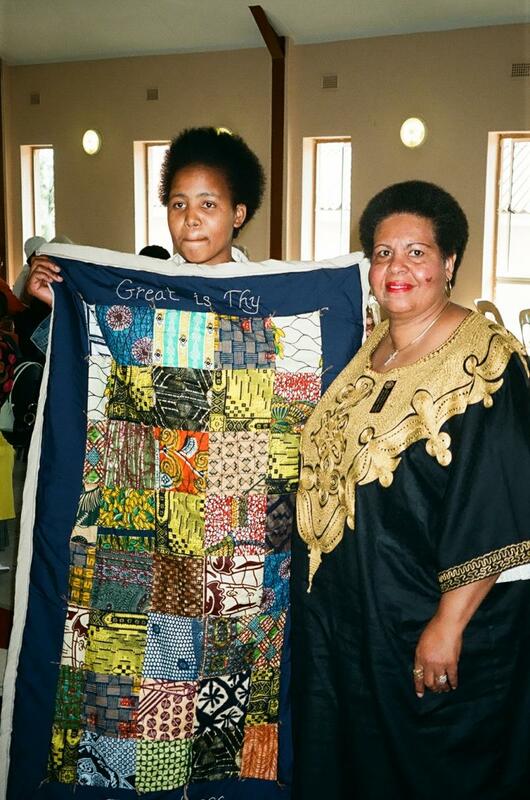 A student from GiGi's Place Day School in the Monarch of Swaziland, South Africa lovingly holding a donated quilt. 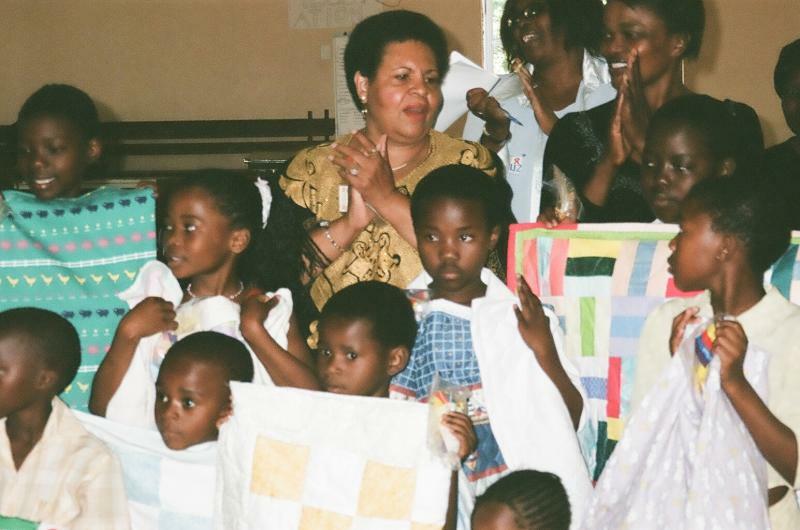 Elder Childs and a group of students holding their quilts and teachers from GiGi's Place, a day school, in the Monarch of Swaziland, South Africa. Elder Childs with teachers, students and students in front of GiGi's Place Day School.